Most of the time, when anyone suggests a recipe for greens, it includes bacon. It’s pretty hard to feel like you are getting healthy and doing the right thing and loading up on dark green vegetables, when they are soaked in pig grease! I’ve been bonkers over kale lately, sauteing it with some garlic, olive oil and salt and topping with chicken and balsamic vinegar. I’ve tried to branch out by eating the type of greens I never bring home, chard. It is no longer super important to me to spend the least amount of money on greens possible. I’d much rather buy pre-cut and pre-washed and spend an extra buck or so. My greens are always washed at home too, I’ve seen too many a bug to be comfortable eating straight from the bag. I found this recipe by simply Googling the term, “Clean Eating chard” and luckily, the dish came out tasting better than I thought it would! 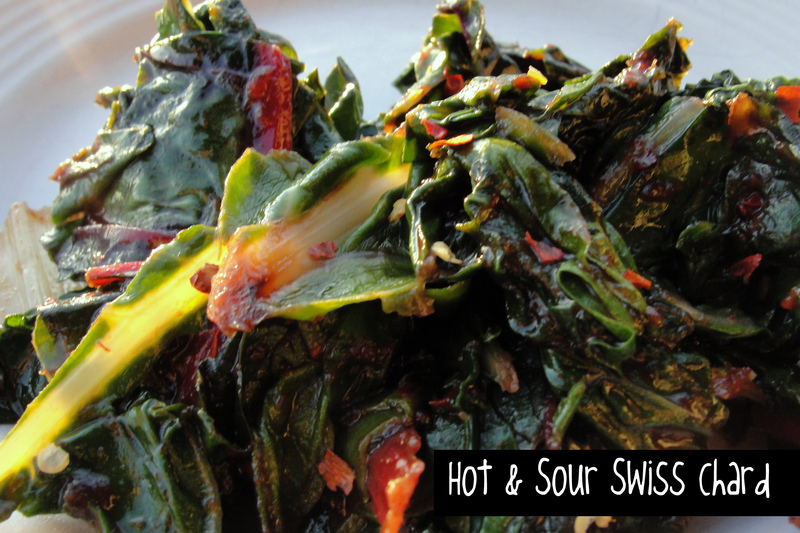 This is super easy to make, you basically saute your chard while you whisk together a sauce. The sauce will need about a minute on the stove and voila! I substituted agave nectar instead of the honey, but it’s up to you how to sweeten. I know the chard in this photo looks greasy, but it’s not. The sauce is mostly apple cider vinegar and tomato paste with honey (or agave). Totally fast and totally healthy. Hurray for bacon-less greens! Ok, time to go hit the elliptical. All this exercising and eating (6 times a day) has left me less time for blogging. But don’t think I forgot about you. Pretend like I’m your boyfriend away at summer camp. I write when I can, but you are always on my mind! (And I’m totally sweaty all the time now).